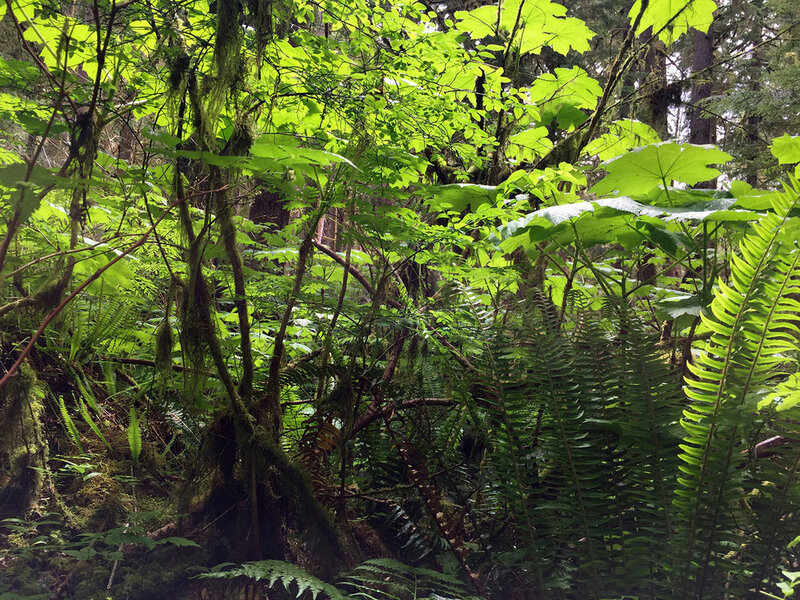 The Rainforest along the Carbon River is my favorite hiking destination. Conveniently close to Seattle, it's far enough that it's well removed from civilization but close enough that it's under 3 hours to drive there. And what a wonderland it is when you get there! The woods that run along the Carbon River are an actual rainforest due to the amount of precipitation they get from the foothills of Mt. Rainier. The easiest way to see it is to hike along the gravel covered Carbon River Road, nearly four miles of an abandoned road that is squeezed on both sides by a dark, massive old growth forest whose trees are covered with blankets of moss and a floor overgrown with giant ferns and massive plants with wide fronds. Every inch of the forest floor, and every tree and branch that falls to it, is covered with a multi-colored carpet of fluffy moss. Venturing off the trail and into the forest is a detour you have to make slowly. There's not a lot of hard ground to walk on, it's more like a subfloor of tree limbs and twigs covered with the moss. Step in the wrong place, or on a branch too decayed, and your foot falls through as if you were walking on an ice lake. Venturing into these forests is like entering a mystical otherworld of life. This is a place covered in a living colony and you can actually feel the physical omnipresence of a life force that is old and wise. I find a lot of comfort and peace in these dark green places, and in the past decade I've come to respect the plant world as beings worthy of the same emotions I fell about other people and animals. When I'm in the forest, and particularly the Carbon River rainforest, I can spend hours documenting the trees, plants and their spaces. My enjoyment comes from finding beauty in the spatial relationships they have and attempting to capture that in a photo. The photos here are all taken with my iPhone after I have photographed the same scene with my film camera - my workhorse, the monster Fujica 690. Shooting film in these darker areas requires a tripod and long exposures, so setting up a shot takes a bit of time. I also keep a notebook of the exposure times/f-stop settings of each shot, along with ideas about how to use them in a composition, to reference after I get the film developed. Sometimes that can be months later, so I rely a great deal on these notes. Many times I will get an idea for a composition - a way of arranging multiple photos or pieces of photos into a larger work (see here for more about my process) - that I need to sketch out in my notebook because I might not understand the sequence of photos on a roll when I'm looking at it months later. Hope you enjoy these photos as much as I like posting them. They're nothing remarkable, but I really like shooting photos on a iPhone when I'm out shooting with my film cameras. Though one thing that bums me out is the quality of the iPhone camera. I have a 6Plus, it's 3 years old, and when I compare these photos to ones I see people taking on Galaxy's, my iPhone photos pale in comparison. Maybe I'll buy a Galaxy phone simply for the camera.